When we met up at the park the lake was nearly frozen over. Just a small pool of water a little ways from shore rippled in the wind. A large flock of Canada geese and various ducks flapped and quacked and honked around the water's edge. "The temperature on my car dashboard said fifteen degrees!" My dad exclaimed when I climbed out of the car into the cold. I chuckled. "Mine said eighteen," I said, "but I was driving east into the sun so that always affects it a few degrees." "I think this weekend may be a record," my dad said. "In twenty years that I've lived in North Carolina I don't think I've ever seen it anywhere near this cold." I nodded into the wind as I leashed Ryder and zipped my coat tight against the chill. Ryder lunged excitedly at the drifts of snow and the geese and the ducks on the lake. The geese just honked irritably and flapped their wings from the middle of the watery patch, but the ducks were jittery and took flight away from the lake shore. I tugged at Ryder to get him focused on the hike and we headed down the trail. The trail around Bass Lake is just shy of two miles and is a wide mulched bed. It loops behind the nature center, past the boat rentals and fishing pier, and hugs the shore of the small lake. It's not blazed but with a well-maintained mulched trail you're certainly not going to get lost. I rued leaving my long zoom lens at home after I saw various songbirds and a beautiful hawk within the first quarter mile of the hike, but with the frigid temperatures and wind chill my hands stayed in my pockets for warmth as much as possible and photos quickly became a second thought. Ryder settled into an easy stride, nosing through grasses and crunching through snowy patches with all the joy you'd expect of a snow dog in snow. With plenty of interactive signs explaining local flora and fauna, periodic benches for rest, and a brief easy bit of elevation change while the trail wandered away from the lake and into the woods for a rendezvous with a picnic shelter, this short trail is a great option for a quick hike or run, and is a great way for kids to burn off energy on a summer day full of boating and fishing or even just a cold winter day to see the ice on the lake. 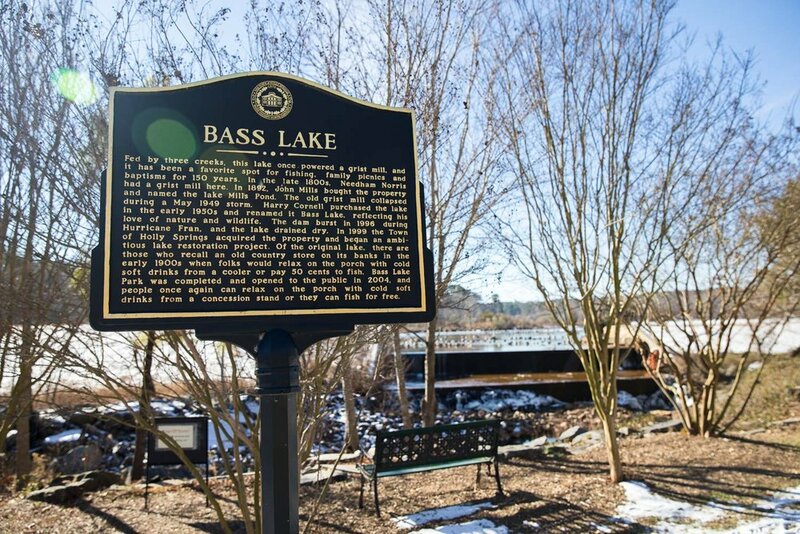 Get there: Bass Lake Park is in Holly Springs, NC. Primary parking is available at the main entrance near the park office off Bass Lake Road. Additional parking is available at the picnic shelter entrance. Distance: The trail loop is right around 2 miles. The loop is technically comprised of multiple trails: Lake Trail, Harry's Walk (which goes through the wooded area), and options to walk 0.12 miles along the road with a very wide shoulder or to venture through some less maintained trail route to close the loop back at the parking lot. That said, in practicality it's all one trail that gets you to pretty much 2 miles even. Dog friendly? Yes, but dogs must be leashed. Kid friendly? Yes, and there are various nature displays and opportunities to explore the lake. Tips: Make a day of it at the park by fishing or paddling on the lake during the summer. Bring your own fishing gear or borrow tackle using the Tackle Loaner Program at the park office. Rent canoes or johnboats between Memorial Day and Labor Day. Or buy something from the concessions and just sit on the rocking chairs on the porch and enjoy some lake views. Have you ever been to Bass Lake or do you have another favorite hike near Holly Springs? Let me know in the comments!